A Divine Name must be written with special intent and special care (273:6;276:2-8). These Names must not be erased (see 276:9-12) and it is forbidden to write them except in books of the Bible (276:13). A Torah scroll must be carefully checked for errors (279:1). If errors are found it must not be used until they are corrected (see 279:3). On the procedure if an error is found while reading from it see (279:2). On correction of errors see 279:4-5. On repairing a torn Torah scroll or replacing parts of it see 280:1-2;290:1. A Torah scroll must be treated with great respect (282:1). It must not be held uncovered or in a disrespectful way (282:1,3-4,7) or with dirty hands (282:9) or taken into an impure place even if it is covered (282:4). A person must stand when it is being carried (242:18;282:2) and must not sit on a surface on which it is resting (see 282:3,7). Holy books must not be turned face down or thrown (277:1;282:5) or put on the ground (282:7) or anything put on top of them (see 282:19), but they may be taken into impure places if they are properly covered (see 282:6,8). On binding holy books together see 283:1; on the order of the books of the Bible see 283:5. A Torah scroll that has become unfit must be buried (282:10). 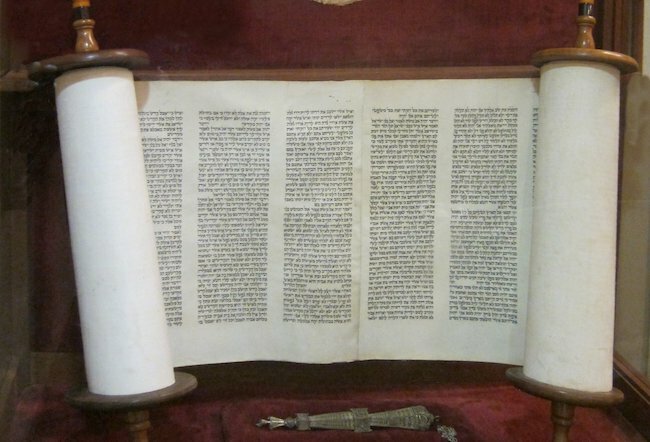 Torah scroll accessories acquire a similar degree of holiness unless they were made on condition that they may be used for other purposes (282:14-15). They too must be buried if they become unfit (282:11-12) and cannot be repaired (see 282:13). Holy things may be exchanged only for things that will be used only for equally holy purposes (282:16,18;290:1) unless the community agrees to do otherwise (282:17). The style of writing used for holy books should not be used for profane purposes (284:2). Phrases from holy books should not be written without ruling (283:4;284:1-2). The books of the Torah may be written separately (see 283:1); opinions differ about writing smaller portions of the Torah (283:2-3).